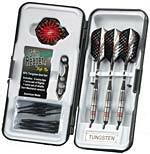 This 90% tungsten dart was designed to fit everyones style. Cross-Hatch knurling for consistent throws. A unique indentation at the nose for consistent grip placement.